Ha, I knew that the title of this post would get your attention. Now get your mind out of the gutter and let’s talk about how a low carb diet can benefit you if you are an athlete. 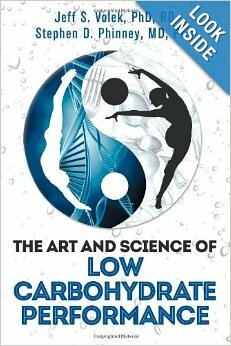 I have just finished reading a brilliant book by Drs Phinney and Volek called, The Art and Science of Low Carbohydrate Performance. These two scientists have been researching low carb diets for the past few decades and are considered as the “go to” experts in their field. If you would like to learn how you can improve your performance as an athlete (especially for endurance events) then keep reading and I will share some key points from their book with you. Yes, I believe this unfortunate event is better known as “hitting the wall” or “bonking”. You might be all too familiar with this scenario. I personally am not, as I prefer to stick with gentler pursuits like walking, dancing and Pilates. But I have a crazy husband who gets his kicks from running up and down mountains for hours at a time. So I challenged him to a little experiment. Would he be able to run faster and stronger in a keto-adapted state and avoid “hitting the wall”? Needless to say, he was game. Keep reading to find out what happened. Carbs have been the preferred fuel for athletes for a very long time. I am sure most of the 2014 Argus Tour cyclists are stuffing their faces with pasta right now. The thing is, carbs cannot be stored in large quantities in the body. At most, the body has access to 2,000 calories of energy during a sports event in the form of glycogen in the muscle and a little bit in the liver. Vigorous exercise therefore depletes this carb tank in just a few short hours. It is the lack of fuel to the brain which results in a sharp decline in physical and mental performance that causes an athlete to “hit the wall”. Your brain basically shuts your body down as a self-preservation tactic. Gels and sugary sports drinks might delay this event for some but others will crash and burn. An alternative to a carbohydrate fuel tank is a tank that burns stored fat. When your body is running on ketones, you will have access to around 40, 000 calories during a sporting event, as opposed to only 2,000 as a sugar burner. Even a very lean athlete with 10% body fat can tap into this incredible supply of energy from fat. So why can’t sugar-burning athletes access their stored fat stores before hitting the wall? Because it takes a few weeks of carbohydrate restriction to get your body into a fat burning, keto-adapted state. How do you become keto-adapted? Typically, you would need to consume less than 50 grams of carbs per day. Within 2 weeks of eating a well-formulated ketogenic diet, which includes good quantities of low carb and high fat foods and moderate amounts of protein, your body will make the switch to burning ketones (fatty acids) instead of glucose for fuel. You will need to purchase a blood ketone meter and ketone test trips. (I have the Freestyle Optium brand which is available in South Africa). With one little prick of your finger you will know within seconds if you are in ketosis or not. If your reading is between 0.5 and 3 mmols then you have hit the sweet spot. Well, the results are amazing! In a short space of time, he dropped 5 kilos and completely leaned out and got ripped. He can run longer and faster and feels like his recovery is much quicker. He ran a 30 km trail run a few weeks ago in 4 hours. During the event he only consumed water, a small handful of nuts and some electrolytes tablets and he finished strong. His list of personal bests is growing and he is feeling great. So great in fact that he is completely sold on the benefits of keto-adaptation and intends to stay “in the zone” indefinitely. He has the 3-day African X trail run next weekend, so he is highly motivated to avoid the beer and make sure he runs the event in ketosis. If you find this radical approach to sports performance intriguing, then I highly recommend you read, “The Art and Science of Low Carbohydrate Performance“. It is important that a ketogenic diet be a well-formulated one and it is not as simple as just dropping the carbs. There is a lot more to it, so please do it properly. Watch this excellent short video clip where Dr. Peter Attia (endurance athlete and nutrition expert) explains keto-adaptation and its benefits for athletes. Posted on March 6, 2014, in Primal 101 and tagged endurance sports, keto-adaptation, ketogenic diet, low carb performance. Bookmark the permalink. 2 Comments. Hi Janine, I know exactly how frustrating it can be when you try but ketosis evades you. I also tried for absolute ages with no success. Eventually I had to cut out nuts, dairy, alcohol and all fruit (even berries) and dropped my carbs to 15 to 20 grams per day. It was only then that I went into ketosis. I just happen to be VERY carb intolerant so my measures need to be more drastic than hubby’s.